Its that time of year again – planning is underway for the 2018 Wine Tour Map. As many of you know, our Wine Tour Map is one of the best-known, most widely distributed and sought after guide for our fast growing region! When tourists are traveling in PEC for a wine tour they need places to stay & eat and they want to experience more of the local charm; that’s where you come in! Our tourism partner listings on the back of the map help create a full and engaging experience within the region. 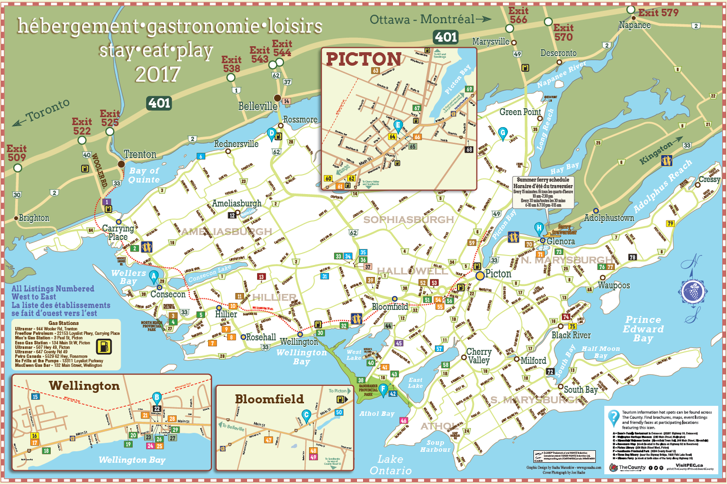 For 2018 we will be printing 120,000 copies to be distributed throughout Ontario; at events and travel kiosks. This year’s map is going to be great – we are keeping all the wonderful qualities that make this map such a strong travel tool while refreshing the look and feel. This year, we want this guide in each and every car and with every motorcyclist and cyclist that tours around PEC! It is one of the strongest assets of this guide – that it is an easy to read and functional map. We want to work hard with our partners to make sure this map is in as many hands as possible – you all work hard and we want this map to work hard for you! For additional listings on the back of the map to advertise other businesses, we are pleased to offer the discounted rates listed on the payment portal. A PDF of the map from 2017 in case you don’t have one handy and need to check your listing(s) is available here. 2. At CHECKOUT, fill in the online form containing all the info you’d like to include on the map. We have created an online submission form on the PECWA website. This is designed to make sure more of your fees go towards distribution rather than administration. Please let us know if you have any questions (email info@princeedwardcountywine.ca). We must hear from you by March 31, 2018 in order to be included on the map this year.